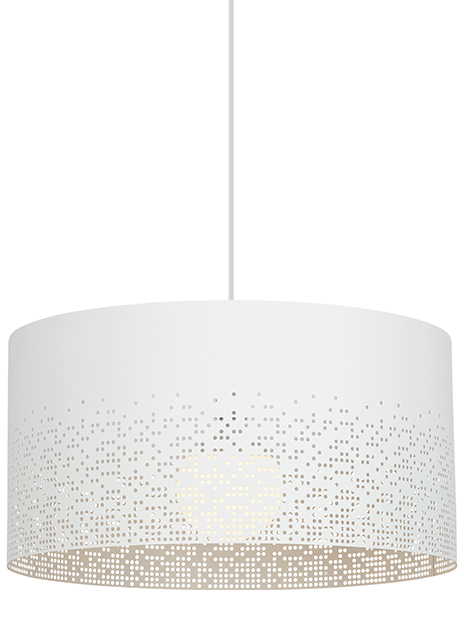 The Crossblend Grande light by Tech Lighting features a fun perforated geometric pattern that trims the bottom of the metal shade allowing light to generously shine through onto surfaces below. The classic drum shade silhouette is wholly updated with this unexpected treatment while still maintaining a tailored look. The ubiquitous styling makes the Crossblend a highly versatile complement any contemporary setting. The Matte White finish makes it a perfect choice to be installed as foyer lighting, dining room lighting or in a commercial setting. In addition to the Crossblend Grande is the Crossblend 14 Flush mount and Crossblend pendant, simply search for the Crossblend Grande to find its closest relatives. Available lamping options include energy efficient LED and no lamp. all lamping options, with the exception of no-lamp, are fully-dimmable to create the desired ambiance in your special space. The Crossblend is damp-rated for an even wider range of installation possibilities. Includes 12' of field-cuttable cable. Available with or without lamp. E26 medium base socket 150w max. LED version includes (1) 12 watt 950 lumens 80CRI 3000K LED G40. Dimmable with a low-voltage electronic dimmer. 120v.